It was excellent defense on James’s part. There aren’t many defenders who can stick with Curry for eight seconds without help. And James probably deserved better than he got. Once you see Curry clutch the ball with both hands and jump back beyond the three-point line—the video below helpfully freezes it—you won’t be able to unsee it. So yeah, a double dribble, though not the sort that usually gets called, but it’s hard to fault James for selling out and leaving his feet, which gave Curry the space he needed to drive past. There’s zero point in harping on the no-call—the Warriors thoroughly outplayed every non-LeBron Cav, and one play was not going to swing this game. And also: Just enjoy a great highlight, you dummies! But Curry thought there was room for improvement. To go along with 32 points, 10 rebounds, and 11 assists, he also turned the ball over eight times. He says that can’t be repeated. I don’t know that it’s necessarily a “need.” The Warriors, unlike the Cavs, can afford mistakes. Game 1 showed that they can do it even with off-nights from Green and Thompson. Game 2 was a case study in how unbeatable they are when everyone’s hitting. 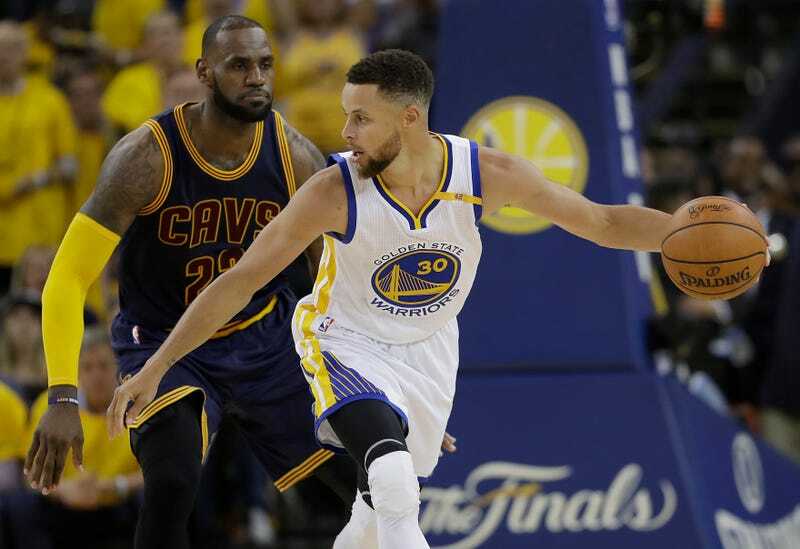 And if not unbeatable, then unbeaten, which is functionally the same thing—with the win, their 14th straight in this postseason, the Warriors set the record for most consecutive playoff wins—and the two teams they passed (including the 2016 and ‘17 Cavs) needed two postseasons to do it. Curry has help, no doubt—more help than anyone since Miami-era LeBron—but the two-time MVP remains a force all on his own.